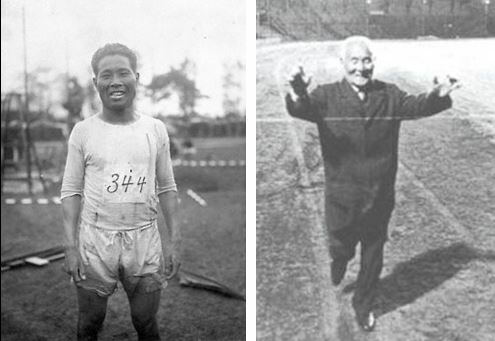 He was one of two Japanese to compete at the 1912 Stockholm Olympians – the first Japanese Olympians. He competed in the 1920 and 1924 Olympics as well. And he created one of the most popular sporting events in Japan – the Hakone Ekiden. Shizo Kanakuri also has the distinction of being the slowest Olympic runner in the history of sport when he competed in his first Olympics. Despite setting what may have been a world record time of 2:32:45 for a marathon trial for the Stockholm Olympics, Kanakuri arrived in Sweden in terrible shape. It took 18 days for Kanakuri and his lone teammate, sprinter, Yahiko Mishima, to get to Sweden by ship and then by Trans-Siberian Railway in time for the running competitions in July. And it was unexpectedly hot in Stockholm, with temperatures hitting 25 degrees Centigrade (77 degrees Fahrenheit), not ideal for long-distance runners. Weakened by the travel, the lack of conditioning, the challenging local diet, and the heat, Kanakuri collapsed midway through the race, somewhere around the 27 kilometer mark. Members of a nearby farming family picked up the fallen runner and brought him to their home and cared for him until he was able to move on his own. Despite the fact that half of the 68 starters also failed to complete the 42-kilometer race, Kanakuri was embarrassed by his failure to complete the marathon, and left the grounds without informing race officials. He then quietly returned to Japan. But as far as Swedish officials were concerned, Kanakuri had simply vanished. Fifty years later, in 1967, Kanakuri was “found” in Japan by producers from a Swedish television station, and to their credit, they made Kanakuri an offer he could not refuse – come back to Stockholm and complete the race. As The Japan Times reported, Kanakuri was very happy to start what he had always intended to finish, even if it took over half a century. At the age of 76, in front of the cameras, decked out in suit and tie, Kanakuri ran about 100 meters before breaking the tape and completing the world’s longest marathon. Posted in Japan, Olympics, Other Olympics, Track and FIeld and tagged 1912 Stockholm Olympics, 1968 Mexico City Olympics, marathon, Shizo Kanakuri. Bookmark the permalink.